For thousands of years, man and fire have had a primal connection. Fire has given us warmth in the cold and provides an enchanting glow of light in the darkness. Campfires have been known to generate some legendary stories and without doubt they add an extra ingredient to our camp cooking. But there’s definitely more to starting and feeding a campfire than meets the eye. It looks so easy, right? Grab a few sticks, some matches and Bob’s your uncle… or is he? Damp tinder and timber, forgotten matches or even the wrong firewood can make building that campfire oh so frustrating. 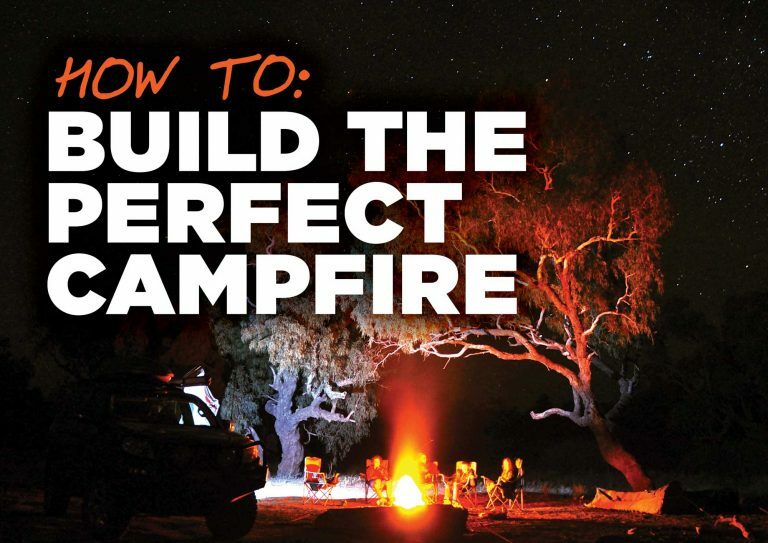 So, what are some of the things you can do to get your campfire going beautifully first time, every time? Whether you’re lighting your fire in a dedicated fire-pit on the ground, or in one of the many and varied steel fire-pits on the market, you need to be aware of your surroundings. Firstly, don’t be that guy! Check the local fire conditions before you strike a match. Ignorance is no excuse for starting a fire during a total fire ban. Think safety first and never build a fire you can’t control. Select a spot for your fire which is away from trees, bushes and piles of leaves. Clear the area before setting up, and remember: There’s nothing worse than turning up to a nice campsite with dozens of old campfire remains strewn throughout, so if your campsite has dedicated fire-pits, then for goodness sake use them. A campfire needs to be built slowly or you’ll risk smothering it completely; and a good fire starts with good tinder. Whether it’s scrunched-up newspaper, grass, bark or leaves, it must be dry. But in this modern age, there really is no reason for not carrying some form of fire-starter in your vehicle or camper. Fire-starters in their various forms provide an easy way to get your campfire going and generally only need the flick of a match in either wet or dry conditions. Likewise, you need some kindling. Dry sticks, twigs and small breakable branches all provide the substance in a fire that grass and leaves cannot. They’ll catch fire readily and be the building blocks for the real kicker – the timber. Some timbers are gnarled and hard, others are soft and smoky; but you don’t always need telegraph pole sized logs to have a wonderfully magnetic fire to sit in front of. Depending on your location, selecting the right timber might be the hard part. Eucalypts such as red, yellow and white box, as well as river red gum and mulga, will make for a hot, slow-burning fire and create fantastic coals for camp cooking. Add a little white Cyprus pine to your campfire to create an aroma unlike any other timber (I’m pretty sure it acts as a mozzie repellent, too). Either way, your wood needs to be aged and dry. Bang two pieces of wood together or tap the wood with a coin or a key. Dry, aged wood will make a sharp resonant sound. Wet, damp wood will make a dull sound. No I’m not talking about a shelter but the concept is almost the same. Building the fire up slowly is the key to starting a fire, and stacking your tinder and kindling in the right way will work every time. My personal preference is the simple lean-to method. Place a small timber log on the ground with a fire-starter or other form of tinder next to it and build the fire up using kindling by leaning it over and against the timber log. Remember that fire needs oxygen to develop and grow, so slowly building the fire up will ensure it gets cranking in next to no time. Strike a match, light your tinder or fire-starter; and once your kindling is away, you can then begin to add progressively larger pieces of timber. Carry a small axe or tomahawk in your vehicle or camper. Not only can you chop timber with it, the back end of the head can be used as a hammer to knock in a peg or two for your annex or swag. Always be conscious of kids around a fire. Black coals may look harmless enough but they can still carry plenty of heat to burn little fingers badly. Let’s face it – kids love a campfire too, so keep a close eye on them. Never throw glass or steel into a fire. It won’t burn and it will look really unsightly the next morning. Do the right thing and carry your empties away with you. Take your plastics away and dispose of them properly (not in the fire). Burning plastic is toxic and creates an awful smell for hundreds of metres around. Carry some waterproof safety matches in your glove box. They can be used in wet conditions and some are also classified ‘windproof’ with an extra long match-head for lighting a fire in blustery conditions. Before you light a fire, make yourself aware of the local fire conditions and use common sense. If it’s hot, dry and windy, it’s probably not a good idea to strike a match. Always extinguish your fire! Campfires generate a considerable amount of heat, which will take some cooling down – and extinguishing a fire can a take a lot longer than you think. You should try and have a bucket of water around the fire for safety reasons anyway, so use this to help douse your fire properly once you’re done with it and before you leave camp for the day. One roll of dunny paper soaked in diesel (not dripping wet) , no kindling, just make the toilet paper the heart of the fire and build the logs up and around the dunny paper. So long as the timber is dry and not green, it will light. The dunny paper will last 20 odd minutes. Been doing that way for years, never had a night without a camp fire. Just make sure you have plenty of dunny paper to spare in case of real life emergency use. Hasn’t anybody heard of the”upside down” fire? Build it and forget it. no need to “build” or tend to it at all.